This past weekend (Sat. - Sun., July 29-30) gave me a unique view of the OBX. After a severe storm passed through the area of Pea Island and Hatteras Village late Friday night, small craft advisories cancelled any diving that was planned for Saturday. The rough seas did get to some aboard our craft, at least ten of our roster of 16 divers fell ill. But the diving was sensational. We had a view of at least 75 feet in any direction at a depth of 80 feet. We were able to spot some sand sharks, though the barracudas were plentiful throughout the wreck. The wreck is a very awe inspiring site and it is humbling to remember how the ship went down (a U-Boat torpedo took the craft to its sea grave in February 1942). The only real difficulty this past weekend was getting back on the boat. With seas churning at depths of 20 feet and above, it made for a very interesting time getting back on board. But our crew, was very professional and able. They made the process of getting back on board easier than even I thought it would be. This wreck is a great site to go to in the OBX. It has history, sealife and unique photo opportunities. 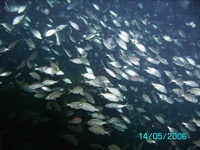 The photo shown above in this blog description was taken by a fellow diver during a trip to the same site back in May. She loved shooting around the Dixie Arrow. This is a good OBX dive especially if you are new to it. At a depth of 70 feet, you can enjoy the wreck and everything around it. Check out the website. It gives you good information and details about the ship. Also if this is your first time in the OBX, try to dive with someone who has some experience with the area. I have come to realize that diving with others that know the area (I went with a group sponsored by my local dive shop in Alexandria, VA) has given me a greater appreciation and overall experience everytime I dive in the OBX. I hope this description helps and makes you want to head out to Hatteras for some wreck diving. I really enjoy the wrecks in the southeast Atlantic region.